As IP continues to become a major part of broadcast infrastructures, replacing or working alongside older technologies such as SDI and MADI, engineers and production crews are finding new and different applications for the technology. Among them is China broadcaster CCTV (China Central Television). 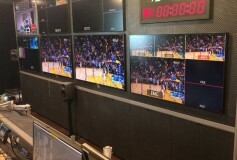 The network recently installed an IP-based location production system along with a 4K studio complete with 5.1 audio. CCTV launched its - and China's - first Ultra HD channel on 1 October. This coincided with the opening of a new 4K production studio, designated E16. The video control room for this features Genelec 8430 IP networked loudspeakers for monitoring 5.1 and immersive audio signals. Located on the 49th floor of CCTV's headquarters in the Guanghua Road area of Beijing, E16 also accommodates a MADI (Multichannel Audio Digital Interface) network alongside the IP installation, which conforms to the SMPTE 2022-7 seamless protection switching standard. The move to 4K/UHD can quadruple the amount of video data involved in a production, compared to what is common for HD. This, observes the designer of E16's audio set-up, makes the shift to IP inevitable. "The IP era has arrived," comments Zhou Fan of CCTV's sound department. "As part of the entire 4K production and broadcast system, the audio must be connected to everything by means of an IP data stream." This is illustrated by the new studio mirroring much of what has already been done with CCTV's electronic field production (EFP) facilities. These went into operation during February this year in time for the 2018 Winter Olympics held in PyeongChang, South Korea. The EFP package includes two Lawo 32-fader mc² 56 and two 16-fader mc² 36 digital consoles using the RAVENNA audio over IP (AoIP) protocol for real-time transport of sound. CCTV EFP audio set up, with Lawo console and Genelec monitors. Click to enlarge. All of these feature integrated Waves SoundGrid processing and are able to handle MADI as well as RAVENNA, which is in turn compliant with the AES67 AoIP interoperability standard. Since the Olympics this set-up has been used on the Shanghai Formula 1 Grand Prix, the World Cup in Russia, the Badminton World Championships in Nanjing and the Jakarta Asia Games. The EFP systems were put together by Hong Kong-based systems integrator and equipment distributor NDT Group, which also worked on the installation of E16. Genelec 8430 SAM (Smart Active Monitoring) IP loudspeakers were selected for EFP operations and these also feature in the new studio to provide continuity in the overall system design, providing integration of network and control functionality between locations and the broadcast centre. The Genelec 8430 remains the only audio monitor currently on the market able to handle IP streams and provide compatibility with AES67. The 8430s installed in E16 are used in conjunction with the GLM (Genelec Loudspeaker Manager) application to simplify networking and processing. Previously any audio coming into the control room as part of a SDI composite A-V signal had to be de-embedded and then converted from digital to analogue before being passed to the monitor controller and, ultimately, individual monitor loudspeakers. By contrast, each 8430 has an integrated RJ45 network port allowing direct connectivity to switchers so IP streams can be inputted and monitored without passing through a converter. This not only reduces cost and system complexity, it also makes incorporating surround sound monitoring into the video control room a viable proposition. In the past it was only possible to monitor the down-converted stereo signal but now the studio director and production team are able to hear a full 5.1 or immersive soundscape. The amount of equipment required has also been reduced, with the work of patch bays and audio matrix links taken over by the GLM working in conjunction with the 8430 IPs. 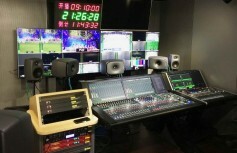 Video control room featuring Genelec 8430 IP monitors, Click to enlarge. The GLM software is run from a dedicated tablet PC located in the audio control room. The wireless remote control component of GLM, usually for switching the main and standby monitor feeds, can also be assigned to any task for safety management or to switch settings for specific programmes. Because the video control room is primarily set up for vision monitoring, the positioning of the loudspeakers, in particular the centre channel and surrounds, was constrained by the space available. This resulted in unsuitable monitoring distances between the different loudspeakers, with the left-right channels two wide and the front-rear being too close. On top of this the acoustics were not fully up to standard because space and budget were both limited when it came to installing acoustic treatments. To obviate these problems, the AutoCal automatic calibration and measurement function, which is standard on Genelec SAM loudspeakers, was used to adjust the frequency response, sound pressure level and delay of each monitor. This specific information is now saved and stored within the individual speakers. Studio E16 - and its audio set-up - went into operation for the 2018 China Open tennis championship. With CCTV's UHD channel now on-air, there are plans to upgrade an outfield production system and several studios to 4K during 2019.